Harnessing effort to design and deliver lasting change requires insight, experience and a constant focus on people in the business. Starting with the end in mind offers clarity, vision and a definition of what success means for the organisational change. Working from the earliest stages to provide analysis and insights to shape a pragmatic change strategy. If needed, we will then work side-by-side with you and your team to deliver change, right through to post implementation benefits realisation. We support you and your teams so that you have Change Confidence. Confidence comes from knowing that you can visualise the end, lead every individual and team along the journey, and construct change interventions that inspire whilst remaining pragmatic. Our experience has shown us that leaders are crucial in igniting and also sustaining change. We have supported Change Leaders for over 20 years. 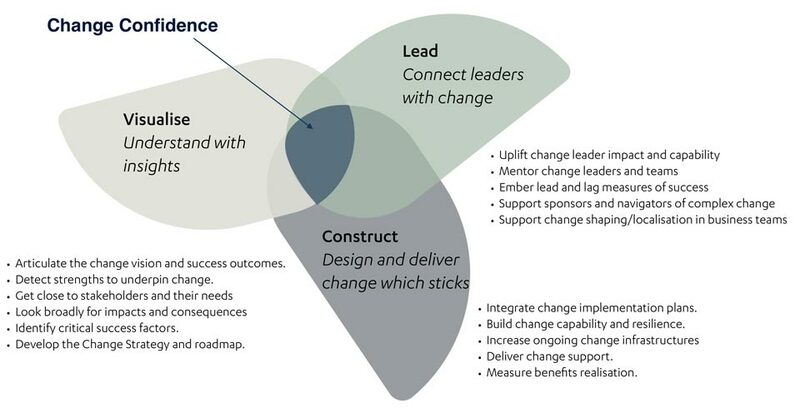 It is not simple to move from being a BAU leader to a change leader. It requires a different lens on the business, people and possibility. We will work with you to construct a program to upskill and support an individual leader or a suite of leaders for their role in championing change. Programs include coaching, action-learning workshops and on-the-job support. We have found that the most insightful ways to bring about change, in an impactful and lasting way, are with the inclusion of both human-centred design approaches (codesign) and psychological principles. We will bring customers or key stakeholders into the room to codesign approaches, plans and solutions from the outset. We use a variety of techniques to involve and jointly design solutions that truly work. When scale is required to build human centric design capability within an organisation, we partner with Dr Munib Karavdic and Wave Design.